Even though i spent a surprising amount of time trying out assorted F2P games earlier this year, it’s been a while since an MMO managed to get its hooks into me past the first four or five hours of play. Lucent Heart managed it for a while but I took a break that turned into simply deciding to put it behind me, and I’d honestly decided that I was probably over MMOs until EQNext came out, if that ever actually happened. I’ve occasionally logged into EQ2 to pay rent on our guild hall, but that’s been the extent of things. Even so, after seeing a fair number of screenshots from TERA (and, while it is technically an acronym and ought therefore be capitalized, I will refrain from doing so henceforth) I wound up interested enough that, when I was at our local Walmart shopping for groceries, I somehow wound up tossing a copy into the cart. I installed it, made a couple of random characters, got to level 20 or so on one of them but just wasn’t feeling it, so I was pretty sure that it was going to wind up a flash in the pan. Then my wife asked if she could make a character to try it out. This was at 10PM or so, so I walked her through the introductory island, went off to do something else and eventually went to bed. When I woke up at 7, she was still playing. Now, I hadn’t really gotten attached to the characters I’d made, and Amazon was having a sale on Tera that dropped the price to $30, so I figured that it might be worth picking up a second copy for myself and giving her the first account. So, I made a new character on this new account and… got it up to level 20 or so and wasn’t feeling it, at which point I put the game aside for three weeks, until Enmasse emailed me to let me know that my free month was almost up. I figured that I would log in one last time, get a few screenshots so that I could write a post about trying Tera and it not really pushing my buttons, and then the third time turned out to be the charm. I lost about 16 hours that weekend, and I’ve been spending at least a couple hours a night since grinding in the vague direction of the level cap, which is currently 60. I hit 36 last night and it has been addictive fun the whole way. Tera’s big draw is, of course, TRUE ACTION COMBAT its combat system, which is far more action game than traditional MMO fare. Enemies actually dodge, roll away, flank you, give little tells to warn you that they’re about to attack, cast AE spells that have visible areas of effect that you need to avoid… It turns the normal mind-numbing MMO grind into something much quicker and more enjoyable, since you’re actually looking at the center of the screen rather than being focused on four rows of buttons and watching for stuff to come off cooldown. There’s also an overall story quest that guides you through the game world. Quest NPCs for this are marked with different color quest indicators, so you can – in theory – ignore all the non-essential quests and just focus on the storyline, which has been pretty fun so far, with lots of angst and epic betrayals and saving the world and so on and so forth. The game has gotten a little bit of a bad reputation based on one particular race, the Elin, who are all tiny girls with animal ears and tail who tend to rush into battle wearing outfits charitably described as “battle lingerie”, which were even more eye-rollingly-disturbing in the original version but which have been censored somewhat for western audiences. They’re still pretty bad. 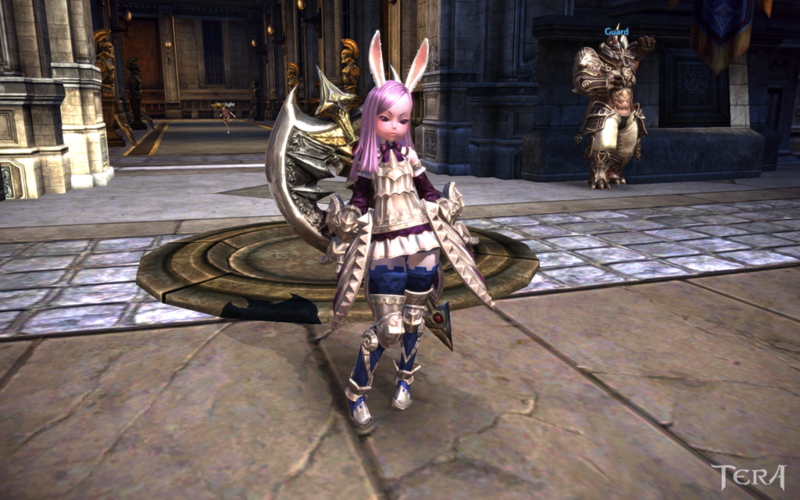 I tried playing an Elin sorcerer and it pushed my “I’m actually ashamed of this” button, which is pretty hard to push. If you’re curious, here’s a site which shows the differences. 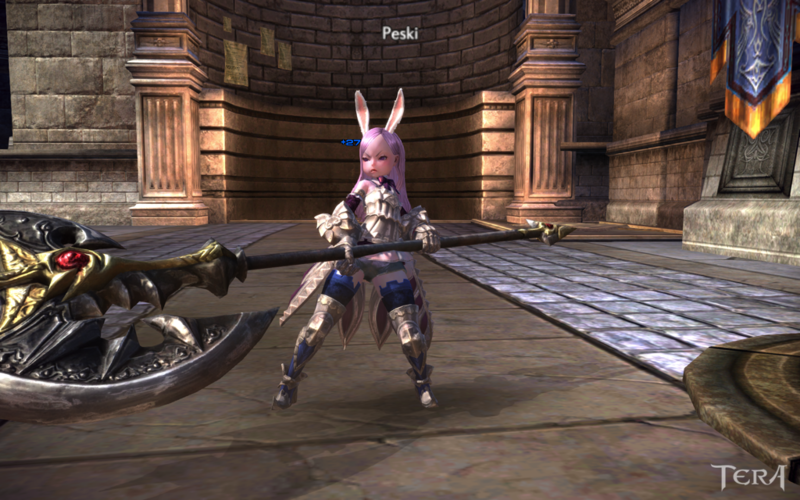 My Elin berserker, on the other hand, is a melee character instead of a caster, so she tends to rush into battle wearing sensible plate armor and carrying an axe twice her height. No battle lingerie here. Her armor does have a bow on it, yes, and it’s color-coordinated to complement her pink hair, but it’s still fairly practical as fantasy armor goes. I will be upfront here; a good part of the reason that I’m finding so much enjoyment in this game is that I get to play the World’s Most Pissed Off Bunny Girl, with a facial expression that doesn’t so much say “look at me, I’m so cute” as it says “get out of my way or I’ll cut you off at the ankles”. You can, as is generally the case in most post-WoW MMOs, cheerfully solo your way to level cap and avoid all that pesky social interaction, but there are lots of opportunities to group up and the grouping community seems quite healthy. The game design actively discourages playing multiple characters at once, and there are as yet no DPS meters around to encourage people to blame you for not pulling what they see as your weight. It does have an enforced item level for joining instances, but that isn’t much of a concession to the min/max crowd and I’ve had no trouble hitting the item level with quested gear. Groups are five people. This particular one has me, two other bunny-Elins, one Popori (Elin bioweapons based on cute fuzzy critters), and one weirdo playing a human. Overall, I think it will easily hold my attention until I hit cap. After that, there are several different activities, mostly revolving around killing harder and harder stuff to get better gear.There aren’t really any raids, per se, though there’s something akin to Rift’s public events that you can take part in at 60, so there’s no real pressure to get into a high-end guild. I’ll take it as it goes. For now, there are ankles to whack with an axe. This entry was posted in MMORPG, PC Gaming. Bookmark the permalink.